After such an abundance of sugar and chocolate we thought it was time to bake something a wee bit healthier! These muffins were the perfect recipe to play with. They bake up surprisingly light and moist thanks to soaking the oats and have just a hint of sweetness. Mix together the oats and buttermilk and let sit for an hour. Beat eggs until they’re frothy then beat in sugar and oil. Mix together flours, baking soda, powder and salt. Mix together egg mixture, dry ingredients and oat mixture just until combined. Fold in dates. Pour batter into lined muffin tins and bake for 20 minutes at 350°F. So I didn’t believe my mother-in-law when she said that these were the best ever banana muffins … but they are! Preheat oven to 375ºF. Mash bananas then mix in the sugar, egg, butter, baking soda and powder until gooey. Add in the Partially Sifted Flour. When combined, add in the chocolate chips. 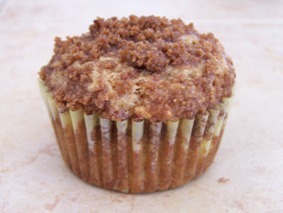 Fill greased muffins tins 2/3 full and bake for about 20 minutes or until a toothpick comes out clean.